“Ordinary Arts” ~ Susan’s charming new porcelain Quote-Stands, your choice of three designs (see "additional photos" at top for all). Each piece is 4” x 6 1/2” and stands alone, on a shelf, counter or table. Decals are hand applied in the USA. “Ordinary Arts” would be perfect displayed among dishes, on a kitchen table or shelf. 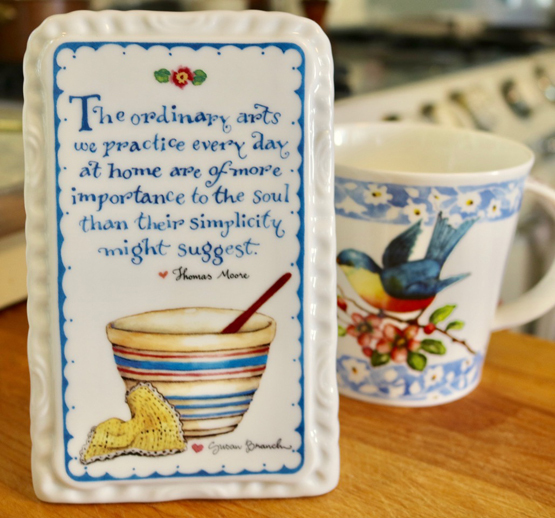 A lovely kitcheny sort of gift, a good reminder about "the little things in life” for a happy household.